All Home-Start regions are linked to the umbrella body, Home-Start UK, which provides information, advice, training and policy and practice guidance in all aspects of managing schemes part of which involves regular and rigorous formal evaluation of the quality of service being delivered. Adherence to best practice is monitored via a bespoke quality assurance system developed by the Charities Evaluation Service and incorporating all the elements of PQASSO, the quality assurance system for small organisations which is recognised as the ‘industry standard’ where the voluntary sector is concerned. The system has also been designed to include and reflect the requirements of Investors in People and other national quality standards. Established in 2004, Home-Start High Peak provides a unique service to families with at least one child under five. Through a network of trained parent volunteers, the Home-Start scheme provides specialised informal, confidential, practical, emotional and crucially non-judgmental support to a family in its own home for a couple of hours each week. It helps parents who are struggling to cope with things like post-natal depression, disability, bereavement, economic hardship, the illness of a parent or child, or social isolation. Parents supporting other parents, sharing their time, parenting skills and experience because they understand the demands and stresses of young families and have a desire to create secure and happy childhoods for all children. 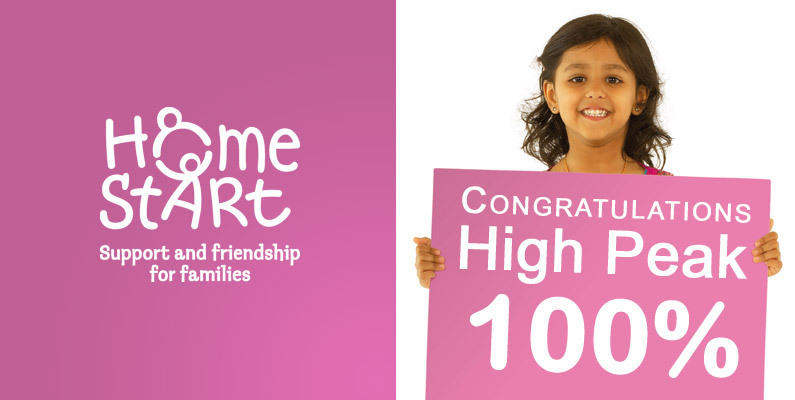 In 2014-15, the High Peak scheme supported 61 families and 80 children. Nationally, Home-Start now supports around 35,000 families and over 71,000 children each year, thanks to the work of almost 16,000 volunteers. “Home-Start was established on the premise that children need a happy and secure childhood and that parents play the key role in giving children a good start in life helping them to achieve their full potential. As a staff of three, supported by eight volunteer trustees and 28 volunteer visitors immersed in the communities we serve, we offer support, friendship and practical help to parents with young children: the kind that statutory organisations just don’t have the resources to provide. Home-Start High Peak has recently launched its first website – built with the goodwill of local experts – which contains information about how to become a friend of the scheme. “We provide free assistance to families going through difficult times of one sort or another and that costs us money. For every £1 we raise, 90 pence is spent on helping local families. About eight pence is reinvested to generate future income and just tuppence is spent on administration (see Make a donation for more details). We recognise that not everyone has the time or the desire to volunteer for us but everyone with an interest in helping can get involved. If people visit www.homestarthighpeak.org.uk they’ll be able to find out how to support our work with either one-off or regular donations, of as little as £1, and how to help with our fundraising efforts in other ways, perhaps through sponsored events, coffee mornings, car boot sales, summer fetes, raffles and collections”. Home-Start is one of the UK’s leading family support charities. We recruit and train volunteers to support parents, in their own homes, with at least one child under the age of eight. The charity was set up in 1973 and now has a network of more than 300 Home-Starts supporting nearly 32,000 families and almost 70,000 children each year. Nearly 16,000 volunteers visit families in their own homes – parents supporting other parents in a variety of situations including isolation, bereavement, multiple births, illness or disability. Home-Start High Peak, 26 Spring Gardens, Buxton, Derbyshire. SK17 6DE. Company number 5400539. Registered Charity number 1110053. For further media enquiries please call Neil Bent, Chair of Home-Start High Peak, on 07957 143 450.